In the build-up to Fallout 76's official launch this week, Bethesda Game Studios did its best to manage expectations for the multiplayer-focused spin-off of the post-apocalyptic role-playing franchise. Beyond playing up how it was the team's first time working with online multiplayer, the developer released a statement before last month's beta test acknowledging there would be spectacular bugs, and saying they wanted players to leave the experience "wondering 'What, exactly, is this?" Fallout 76 launched last week, and after spending some time with it, reviewers seem ready to answer that question. To paraphrase their answer, "This is not good." As of this writing, the Xbox One version of the game is carrying a Metacritic average of 48, while the PlayStation 4 touts a 49 and the PC edition edges into the top half of the rating scale with a 55. "Fallout 76 is a game without a strong focus," said Edmond Tran in his 4 out of 10 review for GameSpot. "It introduces significant changes to the set structure of Fallout 4 to make it function as both a single-player and multiplayer experience. In doing so, both styles of play suffer from major compromises that exist only to serve the other, and as a result, both are weak. Fallout 76 can look and feel like its illustrious predecessors at times, but it's a soulless husk of an experience." The Guardian's Holly Nielsen also settled on the word "soulless" to describe the experience, saying, "Fallout 76 has neither the fun social dynamics and communal sense of purpose that make other online multiplayer games enjoyable, nor the rich characters, stories and world-building that made Fallout 3 and Fallout 4 more than pointless walks in the wasteland." Multiplayer Fallout? What could go wrong? Like a number of reviewers, Nielsen questioned a design decision Bethesda made to fit with the game's premise. Because players are among the first vault-dwellers to emerge from their underground shelters years after a nuclear apocalypse has wiped humanity from the surface world, there are no computer-controlled NPCs. So the things NPCs would normally do in a game--delivering background information, narrative development, and quests--have instead been offloaded onto journals, tapes, and logs left by people long since dead. "It's Fallout at its worst: basic, monotonous and lacking nuance"
"At first there is melancholic interest in figuring out what happened to the previous inhabitants of Appalachia, but constantly reading about and listening to interesting things that you didn't get to be a part of makes the entire game feel like you've arrived late to a party and are left to clean up the mess," Nielsen said. That sentiment was echoed by Wesley Yin-Poole in giving the game an "Avoid" rating for Eurogamer, although he likened it to turning up late to a concert rather than a party. The problem is exacerbated by the game's insistence at assigning activities to the player that aren't terribly engaging. "Most of the quests Fallout 76 has you do are so boring they border on the hilarious," Yin-Poole said. "One early quest had me boil water. Another had me pick up bottles. Most missions are little more than fetch quests. Go here, get the thing, bring it back, interact with a robot, job done. It's mind-numbing in the extreme. It's Fallout at its worst: basic, monotonous and lacking nuance." Bethesda is no doubt relying on the game's multiplayer nature to add some interest to the proceedings, but in an impressions piece for Polygon, Owen S. Good found the game's design working against that goal. "Some bread-and-butter experiences of Fallout - and they are still staples in Fallout 76, too - are simply too boring for group play," Good said. "Hey, want to group up? No thanks, I was going to scavenge for adhesive because I got the gunsmith perk and I want to put all these high-level mod recipes I unlocked on my pipe gun. How about a trade? I'll pass, I have tons of gunpowder and scrap in reserve and the Scorched drop weapons galore. How about we run a mission together? Well, assuming we're even at the same point in the storyline, we're not actually cooperating on a single mission, we're both running the same tasks concurrently." But with a massive world and a maximum of 24 players running around the world at any given time, Yin-Poole said encounters with others are rare. "But when you do come across another player, there's little reason to interact," Yin-Poole said. "I've read forum posts where players tell stories about helping others out, about building bases for newcomers, about following a stranger around for hours for no real reason. But what this is, really, is players making their own fun in a game world that doesn't seem to know the meaning of the word... 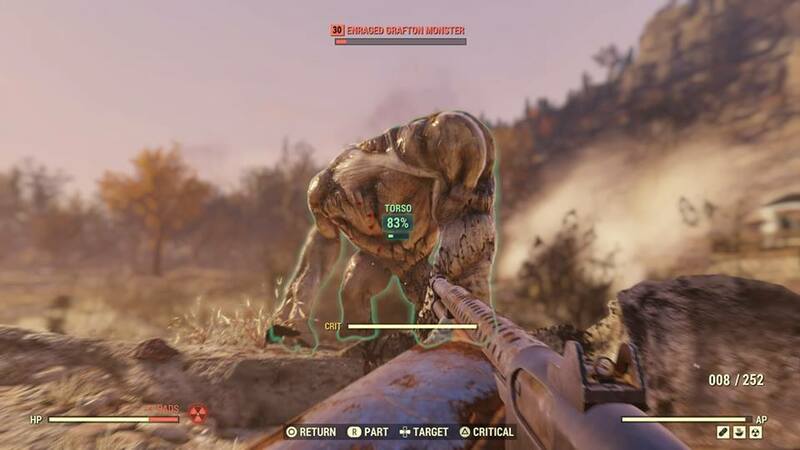 The only reason you'd want to group up with other players in Fallout 76 is to make the killing of bullet-sponge monsters easier and quicker." That's no small motivation, but as the negative connotations of "bullet-sponge monsters" may suggest, combat in Fallout 76 does not seem to be terribly fun. The VATS system appears in Fallout 76... kind of. "VATS in prior Fallout games lets you stop the clock and spend action points (AP) on queued attacks that play out in immensely satisfying, slow motion explosions of gore," Yin-Poole said. "In Fallout 76, the real-time, impossible to pause video game, you can use VATS to do all of that except stop the clock, queue attacks or trigger slow motion explosions of gore. You know, the cool bits! So, all VATS amounts to here is a bizarre automatic targeting system." Aggravating essentially every problem are the game's technical issues. "I've run into countless issues in the PC version, even after the game received a major patch within its first week of release," Tran said. "Problems like clipping through the world, frozen animations, entire buildings failing to load, enemies getting stuck in walls or just not moving, audio logs not playing, enemies spawning out of mid-air, delayed damage detection and world effects, server disconnections, and being unable to complete a quest because someone else in the world killed your target, requiring you to log on and off again until it respawns." "There are echoes of the series' admirable qualities, but look past that facade... and you'll find no heart--just an inconsequential wasteland doomed to be nuked over and over again"
Multiple reviewers acknowledged that Bethesda has a reputation for buggy games, but added that the issues more severely detract from the play experience here, threatening to wipe out hours of progress, crashing the game with unacceptable frequency, or requiring base camps to be rebuilt. 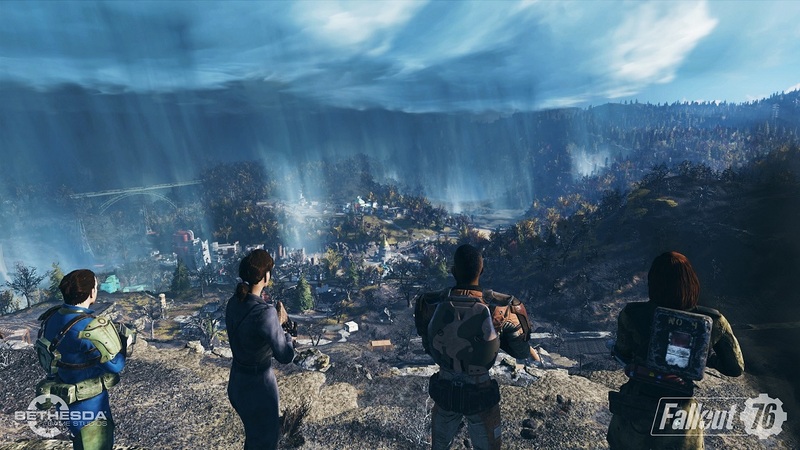 "There are bright spots entangled in this mass of frustratingly buggy and sometimes conflicting systems," IGN's Brandin Tyrrel said in his 5.0 out of 10 review, "but what fun I was able to salvage from the expansive but underpopulated West Virginia map was consistently overshadowed by the monotony of its gathering and crafting treadmill." Tyrell admitted a "genuine satisfaction" to the game's scrap-collecting crafting system, but said that joy is squashed as the game drags on and the focus shifts toward resource gathering and inventory management as players need to build and maintain power armor, weapons, ammo, and survival supplies, juggling everything they have and everything they scrounge to stay within a weight limit lest they be slowed down to a crawl. As for the big late-game power play of launching a nuclear weapon, Tyrell had mixed reactions to the whole thing. "The seconds just before and just after the warhead fell to Earth were the highest of highs Fallout 76 had offered me," he said. "The explosion was spectacular from my planned vantage point. Yet when we ventured to the impact site, now glowing bright orange, in search of high-level goodies, what we found was deeply discouraging. Even the power of a nuclear explosion couldn't shake up the Fallout 76 gameplay beyond nudging the number of hit points the bullet-sponge enemies possessed even higher, which meant it boiled down to fighting stronger versions of the same enemies we'd already killed hundreds of times. The reward: rare plants and resources that would allow us to... craft more powerful weapons and armor to... I guess, do it all over again, except more easily. "Was the slog worth it? Not really, no. And that's when I knew I was done with Fallout 76." Tran was likewise dismayed, saying, "There are echoes of the series' admirable qualities, but look past that facade, past the cute Vault Boy animations, past the familiar radio tracks, and you'll find no heart--just an inconsequential wasteland doomed to be nuked over and over again." Many reviewers mentioned that Fallout 76 is no doubt going to change as Bethesda continues working on it, polishing features and adding more content. That said, there was not a universal optimism that the game's problems could be fixed. "This is not the role I want to play in a multiplayer Fallout game, and this is what worries me most about Fallout 76," Yin-Poole said. "Bethesda can update the game to fix bugs and increase the stash limit and open Vaults and add faction-based PvP, but Fallout 76's fundamentals are deeply flawed." It's not something a player would normally notice, but the final nail for me was finding out the physics runs at the frame rate. That would be amateur hour enough in any game written after 2000, but in an MMO, so now you can run faster than other players by setting your res and quality settings low and looking at the ground? (ノ＞▽＜。)ノ That's a design decision so fundamentally wrong it suggests everything is broken to the foundations. I'm sure they'll make plenty of money on it anyhow, since F2P has set standards so low. In 2018, one no longer has to cancel a game when it just won't come together and the project has run out of its allotted budget. Give it a name outside the main sequence, leave it to PR, astroturfing and consumer brand recognition to make some sales and move on. Good enough for Star Wars movies, good enough for your brand. Still more money at the end, than if one outright cancels it, right? As for damage to the brand name, let's not worry about that ever. The game is vastly worse, and those are words chosen with care, in terms of technical issues, than any other AAA I can recall. Every single time I play, even if it's just for a few hours, I find enough issues that I'd have expected to prevent a console certification, and I can't imagine they're unique to PC. I'm enjoying it, overall, but there's a tremendous amount of frustration inherent in trying to do so. As a very quick example, yesterday I spent about 10 minutes trying to get a vendor to work - I couldn't interact with it, which was a new problem for me. I tried changing servers and the vendor failed to spawn (unhelpful). I tried leaving and coming back to see if it was just a streaming issue. I tried going and talking to another vendor to see if it was a conversation reset issue or something. It wasn't until I gave up and talked to another vendor that I could get closer to that it occurred to me that I had recently equipped a Perk card did a thing that interacted with robots, and that might be the issue :| Yep. The vendor I was trying to use was slightly too far away for that Perk to work, and there was no messaging on why I was failing to Trade with it. The kicker is that the Perk card uses a different button than Trading anyways, and the perk interaction never showed up because it was out of range. I wonder did they just fire all the QA-people during the project because they found too many bugs. I never had any good hopes for this title from gameplay perspective. Angry Joe does have a spectacular review where he dissects the promises made and what the game delivers, which is a big mess.